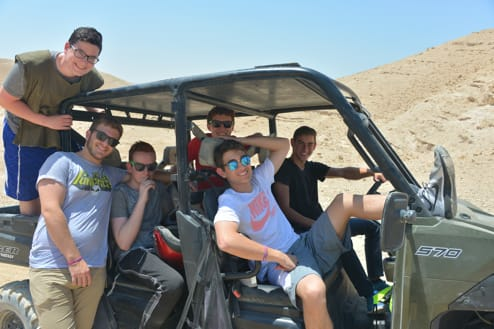 The Jewish Student Union's (JSU) GO is a two and a half week touring experience in Israel for Jewish high school students. JSU GO is an exhilarating, action-packed, transformative journey which allows participants to learn more about their Jewish heritage and culture by interfacing with the history, people, and Land of Israel. JSU GO includes nonstop, thrilling activities all over Israel such as hiking through waterfalls in the Judean Desert and the Golan Heights, torpedo boating and snorkeling in Eilat's Red Sea, kayaking down the mighty Jordan River, rappelling off the stunning cliffs of the Upper Galilee mountain range, navigating through a water obstacle course in the Sea of the Galilee and much more! JSU GO participants will gain an appreciation for both the ancient and modern sites of Israel. JSU GOers will be mesmerized by a visit to the Western Wall and Jerusalem's Old City and feel electrified in the mystical city of Safed. An overnight stay in a Bedouin tent will help participants picture what life was like during biblical times - and of course, camel rides are included! Much time is also devoted to experiencing the more modern sites in Israel such as the shuk in Tel Aviv and Jerusalem's famous Ben Yehuda pedestrian mall!